Cyber Monday Coffee Deals Acro..
Having caught five hours of sleep after an extremely satisfying Thanksgiving meal (unless your adoptive New York mother made perfect Parker House Rolls from scratch, I don’t care about your own Thanksgiving meal), I woke up at 3:00am to watch Netflix’s revival of Gilmore Girls, partly an update for diehard fans of the much-loved if little-watched WB/CW mother-daughter dramedy, but mostly a make-up for the show’s maligned final season. Creator Amy Sherman-Palladino has returned along with most of the cast of the show for four hour-and-a-half episodes chronicling a year in the life of charming and still terrible Lorelai (Lauren Graham) and Rory Gilmore (Alexis Bledel). In the spirit of true Gilmore fandom, I ordered a tub of Hill Bros. Coffee, which Lorelei’s paramour, Luke (Scott Patterson), serves at his no-nonsense diner in Stars Hollow, so I could binge the whole show before my morning cafe shift. I cleaned out my Chemex, which had last been used as a vase four months ago, to brew the stuff. Half a cup sent me straight to the bathroom and I finally figured out how Lorelai eats all of that junk and stays so svelte. The revival, like all of this comeback stuff on Netflix, is pure fan-service, but sweet and clever enough to rise above, say, the astonishingly terrible Fuller House. Sure, there’s way too much Logan (Matt Czuchry) and shockingly little Miss Patty (Liz Torres), but the spirit of the show of the original show is there in abundance. Blissfully, the show still has plenty of coffee. Assuming your Black Friday is too jam-packed with visits to Best Buy and Pottery Barn for deep discounts and your only desire is to catch all of the caffeinated moments between bits of rapid-fire dialogue, what follows is a log of every coffee moment from Gilmore Girls: A Year in the Life. Maybe prepare some coffee that’s a little easier on your stomach as you drink along with Lorelai. 0:19 Audio of Lorelai’s plea for a sixth cup of coffee from Luke plays over the opening credits. Yep, still the coffee show. 1:30 Lorelai and Rory share coffee and tacos from Al’s Pancake World. The fact that their first coffee is not from Luke’s is proof that Amy Sherman-Palladino hates you. 17:55 Lorelai and Rory, both unable to sleep, share coffee in Lorelai’s kitchen as Rory stress tap dances, having failed at meditation. Cute. 18:43 Rory recalls lunging at Gail Collins in the Times Center while jacked up on coffee. We never find out where Rory drinks coffee in New York. 20:48 Luke offers coffee to customers at Luke’s. What a reliable dreamboat. 21:47 Lorelai orders coffee from Luke. LOVE ISN’T DEAD. 23:32 Lorelai gets her coffee to go. LOVE IS PORTABLE. 26:48 Lorelai kicks Roy Choi out of the inn for moving her coffee machine. Sookie is away, growing vegetables with Dan Barber and definitely not moving his coffee machine. 54:49 Lorelai drinks coffee at Luke’s after hours following a tense visit with Emily and I start to remember that I’d way rather spend time with Emily over bratty Lorelai. 57:30 Lorelai has a “strong and a little crunchy” coffee at Paris’s fertility clinic. With Paris’s attention to detail, shouldn’t this be the one time the show name-drops a fancy coffee brand? 1:10:40 Rory grabs coffee from Luke’s after a rendezvous with Logan in London. This is the start of SO. MUCH. LOGAN. 5:40 Lorelai makes a Kofi Annan coffee joke at the Stars Hollow International Food Fair. I’ve had coffee at the UN and I still don’t know how Kofi likes his coffee. 19:47 Michel laments the lack of Nespresso machines in the Dragonfly’s rooms and displays his knowledge of Daniel Radcliffe’s coffee routine, which is a gross one because it involves Nespresso. 22:55 Lorelai has a late night cup of coffee after having a recurring dream about Paul Anka. Another example of how Lorelai gets everything I want. All I’ve ever had is a nap dream cameo from Lindsey Bunckingham. 43:20 Rory turns down coffee from Headmaster Charleston at an alumni speaking event at Chilton featuring someone who is not Chad Michael Murray playing Tristan. Yep, Amy Sherman-Palladino definitely hates you. 1:01:15 Lorelai shows up late to therapy with coffee she picked up at a drive-thru and because she’s terrible Lorelai, she brought no coffee for her therapist. 1:09:20 Lorelai watches a scene in A History of Violence where Viggo Mortensen serves a pair of thugs coffee before killing them. Lorelai surmises that David Cronenberg met Luke once and modeled Mortensen’s character after him. Did you know Luke was in, like, three Saw movies. He stabs himself in the neck with a pen to save himself from drowning, which Luke would probably do. 1:14:10 Lorelai gets coffee while Rory conducts interviews for her spec article on people who stand in lines in New York City, a piece that could maybe make her the next David Foster Wallace. I’m working on an eight hundred page tome about my frenemies on the LES that’s going to make me the next W. Somerset Maugham. 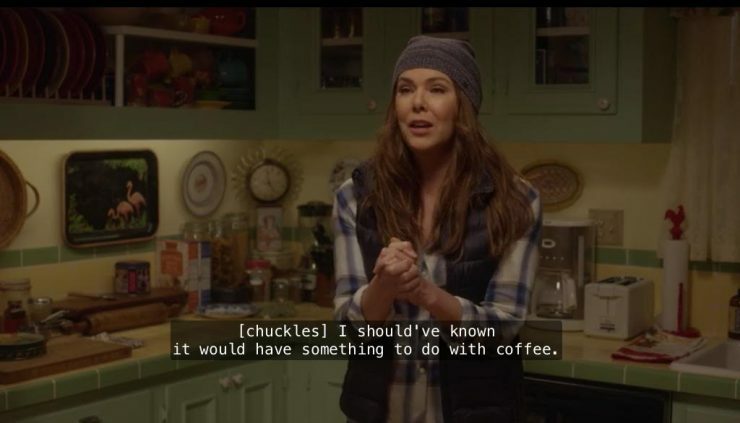 3:47 Lorelai tells Luke to drink coffee so he’ll stay up and binge watch the French zombie series The Returned with her. If it’s the Hill Bros. from Luke’s, he’ll miss all of the Euro zombie anguish during his trips to the bathroom. Seriously, that coffee is the worst. 27:30 Taylor tells Rory to clean the coffeepot at the Stars Hollow Gazette office. Rory says it needs a jackhammer. Call Urnex, gurrrrrl. 29:25 Lorelai drinks a cup of coffee in the Dragonfly’s kitchen as Luke succeeds Rachel Ray as the inn’s newest pop-up chef. Rachel Ray acted so hard in this, y’all. 34:42 Lorelai and Rory drink coffee at home after delivering Rory’s first issue of the Stars Hollow Gazette. I can already tell that this stupid plot will last way too long. 35:47 Emily asks her housekeeper to bring her coffee after she wakes up at noon and it becomes clear that there is not nearly enough Emily Gilmore in this thing. 48:58 Lorelai keeps a cup of coffee on hand while she criticizes Stars Hollow: The Musical. Sutton Foster’s cameo is longer than Miss Patty’s screen time in the whole revival series. I mean, Sutton Foster is very talented but Amy Sherman-Palladino clearly literally hates my stupid guts. 1:16:12 Lorelei storms into Luke’s for a sixth cup of coffee after fighting with Rory over Rory’s planned autobiographical book, which is the kind of silly setup for a Lorelai/Rory fight that makes me hate loving this show. 6:34 Charlie tells Rory that he’s had coffee because her stint as the editor of the Stars Hollow Gazette has lasted more than one episode. Ugh. 7:39 Luke makes coffee as he struggles with Lorelai’s departure to the Pacific Crest to recreate Cheryl Strayed’s hike from Wild. This plot is surprisingly not the most awful thing ever. 34:48 Lorelai fails at her attempt to be Cheryl Strayed and goes to get coffee, but the shop is closed. So poetic. 41:28 Lorelai gives a speech to Luke and says her whole life is about coffee AND IT WAS ALL WORTH IT. 55:14 Lorelai and Rory make up in the kitchen. Lorelai offers coffee but Rory declines in favor of ice cream because, while Lorelai’s life is all about coffee, Rory’s life is about being the worst. 1:37:18 After Luke and Lorelai marry, Lorelai and Rory sit under the gazebo and share one last… glass of champagne. The ultimate betrayal. A shocking revelation follows that promises another season where champagne won’t be a suitable substitute for coffee. And that’s it. Unless they bring this thing back again for a movie, or decide to reanimate the corpse of Edward Herrmann for another “Special Appearance”, this concludes all examples of coffee in the Gilmore Girls revival. Thanks for everything, and nothing, and everything, Amy Sherman-Palladino. Eric J. Grimm writes about pop culture and film at Sprudge, based in New York City. Read more Eric J. Grimm on Sprudge.